Do you know where I found all of the above? 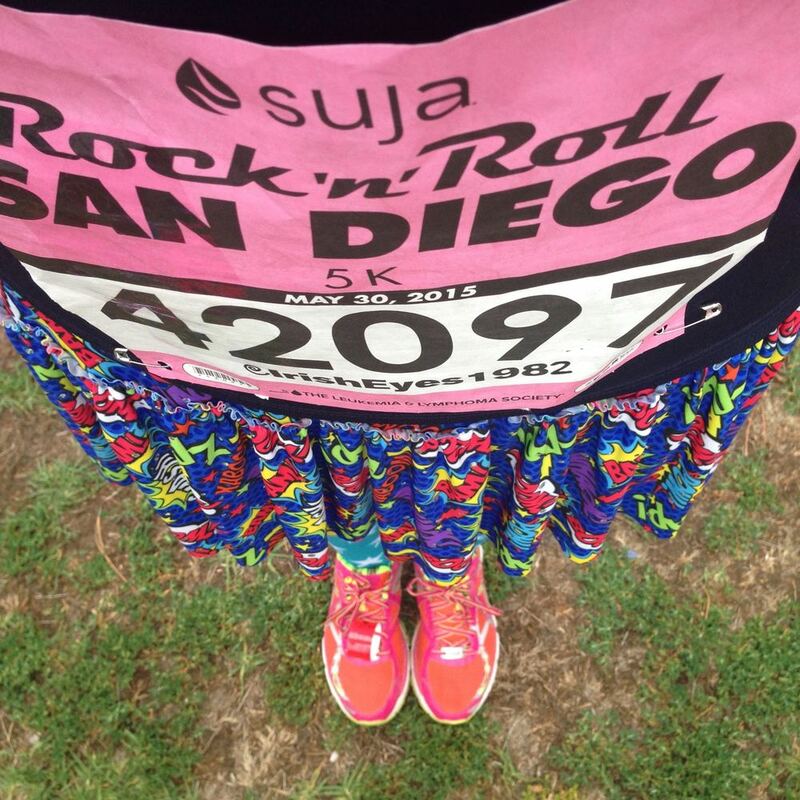 The Rock 'n' Roll San Diego 5k baby! The phone alarms trilled off at 5am on Saturday, May 30, throughout the hotel room. The Briggs Family (Sarah, Rob & Colin) and I were ready to tackle the RnR San Diego 5k. The race started over a mile from our hotel (Marriott) so we opted to get in a cab and save the legs for race time. Once on site, I immediately headed to check out where my Start Corral would be. We made our way over to a nice grassy area so we could stretch, get our bibs on, scope out the port-o-potty line and wait for our crew to arrive. I had to break out the big guns for the run - aka the cape! Once Carlee arrived, it was time to connect with the rest of the We Run Social crew for a pre-run photo. 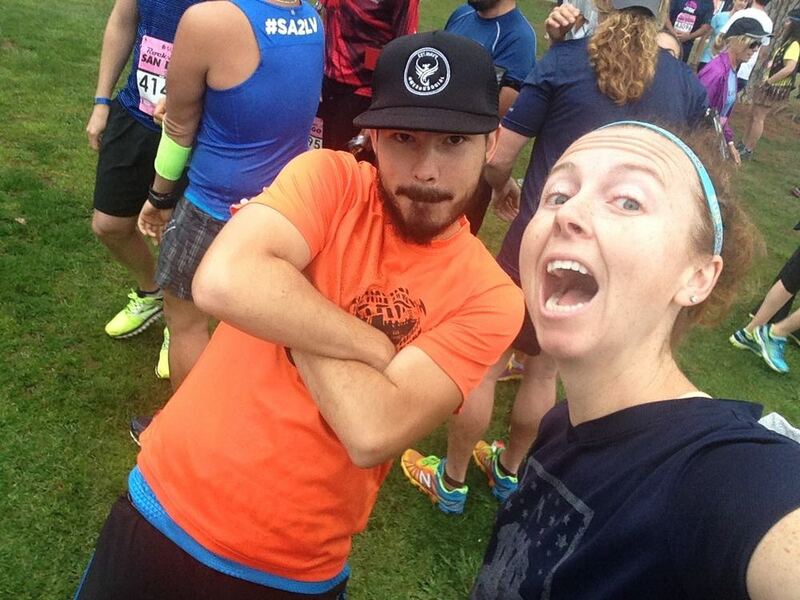 With hugs, high-fives and selfies shared amongst the group, we headed off to the Start Corral. While some folks would be racing the 5k, Rob, Sarah, Colin, Linzie of Sharp Endurance & I were there to Fun Run. 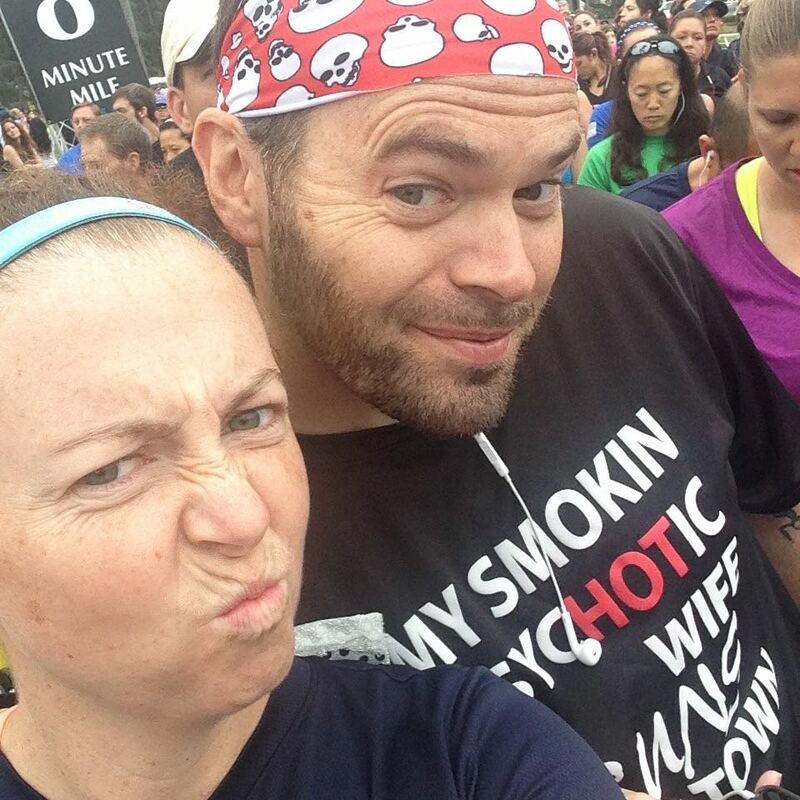 Linzie and I had run the BAA 5k prior to the Boston Marathon together and were ready to repeat that awesome experience. We edged our way into the Start Corral wherever we could find an opening. Our goal for the run was simple: All the Fun. All the Selfies. The route offered a simple out and back on 6th Avenue before turning into Balboa Park. Our fantastic foursome crossed the Start mat and were ready for 3.1 miles of fun. We were focused on running together and keeping the pace in check. We were hoping to finish around 35 min or so. While we were making our way out on 6th Avenue, the beginning of the pack was already on the return. It was a great opportunity to cheer on our friends who were racing the 5k. THIS is why I love out and back courses. We finally hit the Mile 1 marker and I alerted the group that it was selfie time. Dammit! Too fast. We were going for a slower pace, but everyone was feeling good. After we hit the turnaround, I spotted a barefoot runner. I am always amazed by the folks that can do that. I just don't see it working for me, but give them major props. Plus I loved his blow-up guitar. As we made our way back down 6th Avenue, we passed the Start Line on our left and I spotted my girl Angela from We Beat Fat! Angela is a fellow blogger and Team Chocolate Milk member. She and her husband combined to shed over 500 pounds. Talk about inspiration. Wicked glad I grabbed a selfie with her while she was waiting to start the race. After a quick pic, I caught back up with my crew. Everyone was looking strong and we were all in sync. We hit a bit of a downhill before turning right back around for an uphill. That's right folks whatever goes down (dirty minds) must come back up. :P To keep the group motivated, we all shot for the Mile 2 marker, which was at the top of the uphill. We powered towards the selfie led by Colin! Just after the mile marker, we took a right on to Juniper Road and headed inside the park. I skipped the water stop, but made sure to snap a pic of the cheerleaders. They were doing a great job motivating the crowd. We savored the downhill on Balboa Drive before turning around and immediately tackled the uphill on 8th Drive. And then it happened. Colin and Rob took off in a Sprint. Linzie started channeling his inner Kenyan. Sarah needed to catch up to her husband and son. And then there was me! 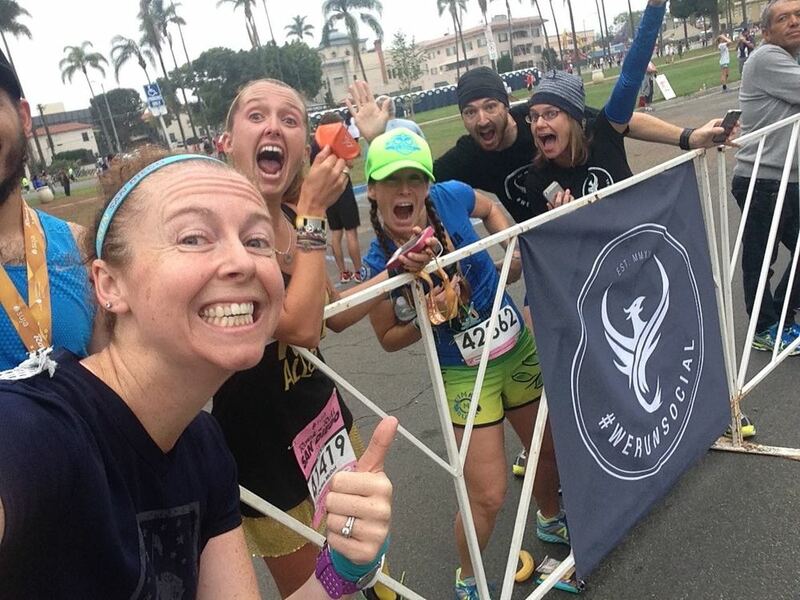 I stopped to selfie with the We Run Social Crew. But I needed a special photo op to really cap off this race. Those pics alone were worth any seconds tacked on to my Finish Time. I thanked everyone for the selfies and finished off the race. Gorgeous bling! I absolutely LOVED the design. The race was awesome even though I was deserted within the final 0.1 miles, but I was happy to see everyone blow past me with huge smiles on their faces!! :) I appreciate them staying with me and laughing and running for the first 3 miles. Once the race was over, we headed back to just after the 3 mile mark to cheer on the rest of the participants with the We Run Social crew. I LOVE being a race spectator. Cheering on folks finishing their first or 1,000th race. Watching smiles on people's faces get wider as they got closer to the Finish Line. Seeing people really dig deep to finish strong. Enjoying the costumes that folks put together. All of it makes me honored to be part of the running community! After seeing the final few finishers cross and taking an obscene amount of awesome pics together, we opted to walk back to our hotels as a group. It was a great time to see how people's races went and to set plans for later in the night. We need to carbo load as everyone in the group was either running the Half or the Full. 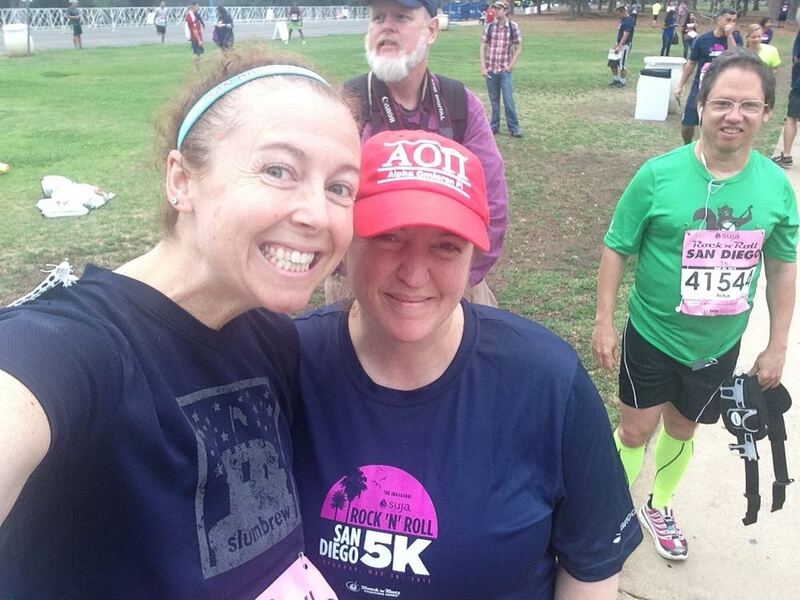 Thanks Rock 'n' Roll for putting on a fun 5k! A special shout out to the Briggs Family and Linzie for spending the morning with me. 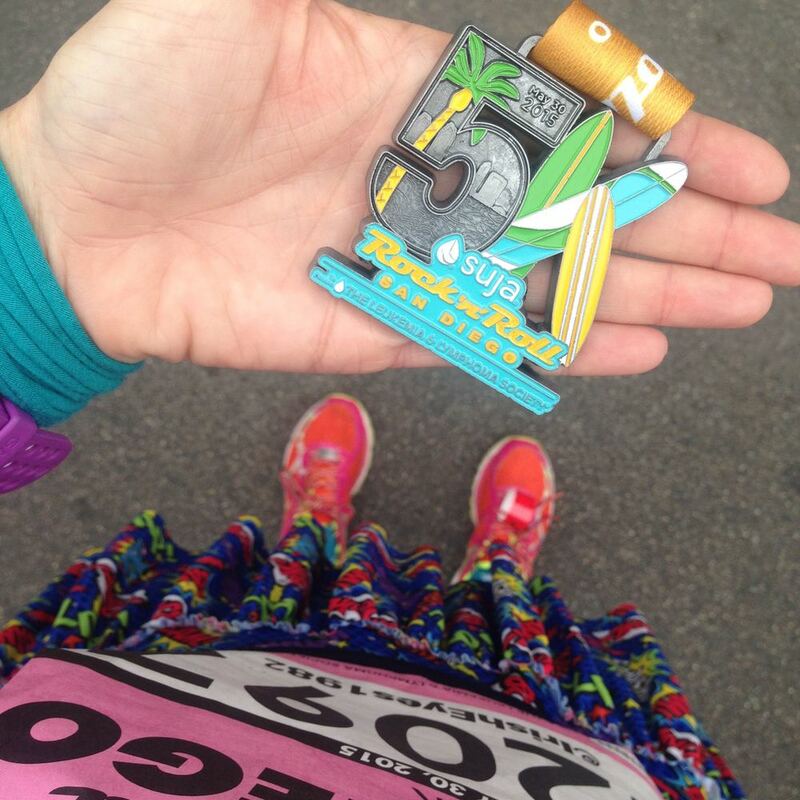 Have you ever taken part in a 5k as a shakeout run for a bigger race the next day?